It’s been a while since I’ve updated y’all on my fall capsule wardrobe. I haven’t had a chance to take outfit pictures yet, but hopefully those are coming soon. In the meantime, here’s a look at the new pieces I purchased for this season. As part of the capsule experiment, I set a strict budget and carefully considered each item before buying. And I’m really happy with each and every piece! In this selection, you’ll see mostly tees, dresses, some new outerwear, and fun shoes. I picked up three t-shirts because the vibe in my office is very laid back, and I didn’t have many casual tops. I like to throw these shirts on for an easy look, especially layered under a sweater or cardigan. Both dresses were great finds from Gap. I love to wear dresses because they are so much more comfy than jeans, but I didn’t have any that are appropriate for work. Both of these are suitable for the office and perfect for fall. The gray cashmere sweater is now one of my very favorite items in my closet. It’s so classic and chic, yet also utterly soft, warm, and comfy. It was a bit of a splurge, but I know that it will last me for years to come. I’m hoping to pick up another color for my winter wardrobe. Speaking of outwear, I love this navy vest, too. The down material makes it extra warm, even though it’s very light, so it’s the perfect extra layer during my walk to work on chilly mornings. Finally, these shoes! The sneakers, with their fun heart design, are another casual choice, while I’ve been lusting after these leopard print flats for ages. Both add an unexpected dash of interest to an otherwise subdued outfit. While we’re chatting about my new purchases should we talk financials, too? I know that everyone has a different approach to spending, and different financial priorities, but I found that this budget worked for me. I decided to put aside $600 for my fall capsule. Since these are the only clothes I purchased for this three-month season, that comes out to $200 per month. This felt comfortable, especially because I was planning to pick up a few staple items. After investing in high-quality pieces for the next few seasons, I expect my spending to eventually decrease for future capsules. And I ended up coming in way under budget! By taking the time to thoroughly research my purchases and consider exactly what items I needed to buy for this capsule, I was able to snag each and every piece on sale. I ended up spending $424 total. Amazingly, the full (not-on-sale) value of these items was $802. So, what do you think? 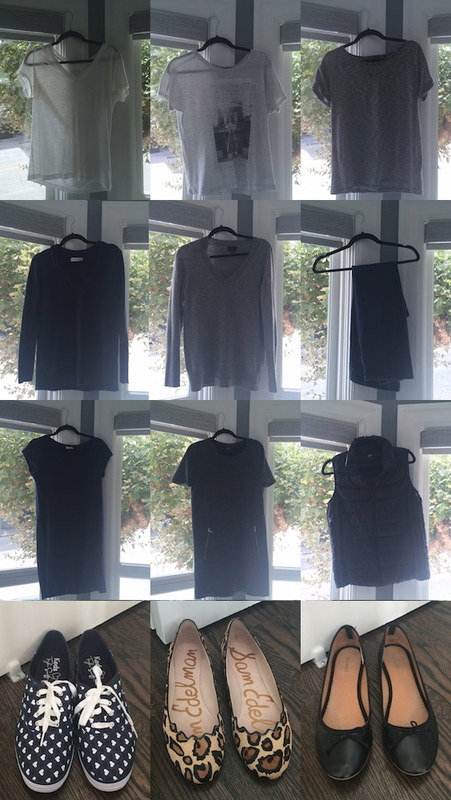 And have any of you adopted a capsule wardrobe for fall? If so, let me know in the comments below what some of your go-to items are! Wow, good job on the budget and I admire you for knowing what works for you and not getting distracted when you go shopping!